Feel the heat of Bicolano fare at this sweet and spicy food fest. Slightly sweet and super spicy-that’s Bicolano fare for you. Click for more. Two distinct qualities characterize Bicolano fare-a certain creaminess from being generously doused with gata (coconut milk), and that classic spiciness that roots from a penchant for sili. 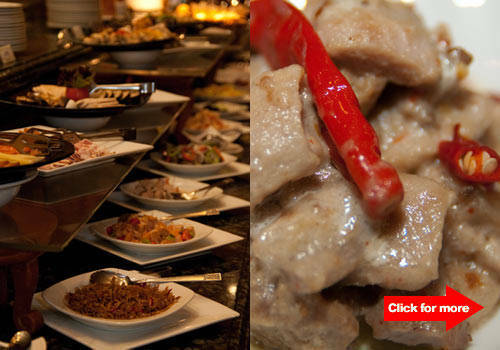 Kulinarya at Century Park Hotel remembers these two traditions in its Bicolandia Food Festival, an integration of this region’s fare in the restaurant’s buffet menu. The festival is a tie-up with the Department of Tourism to promote more awareness about local cuisine and culture. Taking a gastronomic trip to this region means savoring a medley of sweet, sour, salty, and peppery dishes that make Bicolano fare uniquely theirs. Inonon na Sira, a fish dish deliciously stewed in vinegar, has a particularly eye-popping, taste-bud opening tanginess that prepares the palate for the flavorful meal ahead. Next, try a mildly-flavored specialty: Kulinarya’s Kinunot na Page, a delicacy usually made with shark or stingray, uses shredded fish lightly peppered with horseradish leaves that are made extra sweet and juicy with gata. While shark or stingray meat usually gives it a chewier texture, the softness of the fish makes this dish much more succulent. 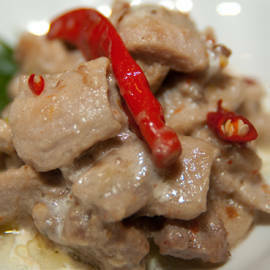 What’s a Bicolano festival without the famous Bicol Express? Traditionally made with balaw (tiny shrimp), Kulinarya uses the second-best alternative-lean and tender pork cuts in fresh gata and spiced with sili. A warm, appetizing scent from the coconut milk is in every spoonful, and under its peppery flavor lies bitter and salty hints from various spices. With this region’s firecely-flavored fare, we deem it best to counter the heat with Maluto sa Pandan-fragrant rice steamed with Pandan leaves sporting a yellowish tint that’s softer and much fluffier than white rice. End the meal with sugary treats like Bukayo, a crisp chewy ball of caramelized coconut, and Biko, a simple rice cake amped up by a generous drizzling of caramel. Kulinarya's Bicolandia Food Festival ends on July 15. It's P1,215 for adults, 50 percent off for kids aged six to 12, and free for kids aged five and below. Patrons will also be given a complimentary drink coupon.